When a cataract progresses to the point that it affects a person’s ability to do normal everyday tasks, surgery may be needed. 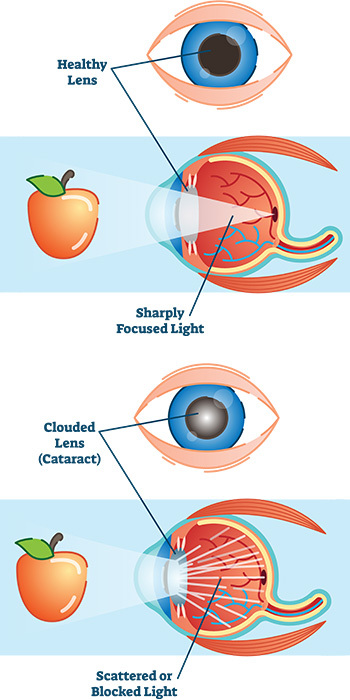 Cataract surgery involves removing the lens of the eye and replacing it with an artificial lens. The artificial lens requires no care and can significantly improve vision. Some artificial lenses have the natural focusing ability of a young healthy lens. Researchers have linked eye-friendly nutrients such as lutein and zeaxanthin, vitamin C, vitamin E and zinc to reducing the risk of certain eye diseases, including cataracts. For more information on the importance of good nutrition and eye health, please see diet and nutrition page on the American Optometric Association website.